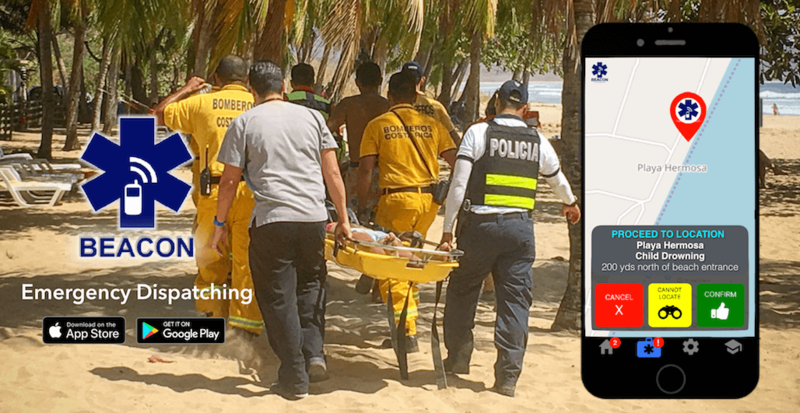 Norwalk, CT – Trek Medics International, a nonprofit technology startup, has launched a new companion mobile app to their emergency dispatching platform, Beacon. The Beacon mobile app, funded with support from Twilio.org and the Tides Foundation, will allow community first responders to receive and respond to emergency alerts using both smartphones and feature phones, with or without an internet connection, making 9-1-1-style emergency response coordination possible for anyone with a mobile phone signal. The Beacon mobile app will provide major upgrades in user experience and mapping to the SMS-only version currently being used to support emergency services in Latin America and Africa, including: a map-based user interface for Android and iPhone mobile phones; dual SMS and push notification messaging; GPS location services; availability in 5 languages; and an easy-to-use two-step registration process. The Beacon mobile app, developed in collaboration with Vision Point Systems, (Blacksburg, VA) was made possible through a Social Impact Fund Grant from Twilio.org and the Tides Foundation. Twilio, a global pioneer in internet and mobile messaging provides the technology that powers Beacon’s text message-based emergency communications in 15 countries and counting. Since 2014 the Beacon emergency dispatch platform is being used to ensure reliable emergency dispatching for fire departments and ambulance services in Latin America and Africa by alerting and coordinating volunteer and professional first responders to thousands of life-threatening emergency incidents, including for motor vehicle collisions, women in childbirth and infectious diseases, among many others. Beacon was also used this past fall in the Dominican Republic to assist in the coordination of local responders during hurricanes Irma and Maria. Download the Beacon Mobile App for Android and iOS today!